Local Century 21 Realtor, Sandi Gratz, along with Amber Quinn, both co-owners of BeBalanced, spearhead holiday shoe donation drive for Soles4Souls. At BeBalanced we feel very strongly about giving back to the community and combatting poverty. BeBalanced is hosting a holiday shoe donation drive for Soles4Souls, a nonprofit global social enterprise committed to fighting poverty through the collection and distribution of shoes and clothing. New or gently worn pairs of shoes can be dropped off at BeBalanced, 6167 West Jefferson Boulevard in Fort Wayne, IN, from October 1 to December 1. “At BeBalanced we feel very strongly about giving back to the community and combatting poverty,” said Sandi Gratz, a Century 21 Realtor who opened the Fort Wayne, IN, BeBalanced franchise location with her daughter, Amber Quinn, in June. Soles4Souls aims to eradicate extreme poverty by 2050. Children every day are prevented from attending school and adults are unable to work as walking becomes unbearable, which perpetuates the cycle of poverty. To date, Soles4Souls has collected and distributed more than 30 million pairs of shoes to those in need in 127 countries around the world and all 50 states in the U.S.
About Sandi Gratz, Century 21 Bradley Realty, Inc.
Century 21 Realtor Sandi Gratz serves Allen, Dekalb, Noble, Whitley, Steuben, Huntington and Wells county, IN. 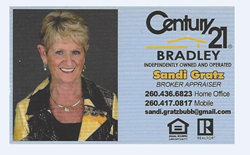 Sandi is a Graduate, Realtor Institute, member of Fort Wayne Board of Realtors as well as National Association of Realtors and a State Certified Appraiser. For more information, please call (260) 417-0817, or visit http://www.sandigratzbubb.c21.com. Century 21 Bradley Realty is located at 2928 E. Dupont Rd., Fort Wayne, IN 46825. BeBalanced is a franchise of women’s health clinics filling the gaps between the weight loss industry, hormone replacement industry, and medical community. BeBalanced’s overall mission is to help women live healthfully, achieve fast weight loss and long-term weight control, and look and feel their best at any age. For more information, call (260) 710-8109, or visit http://www.bebalancedcenters.com.